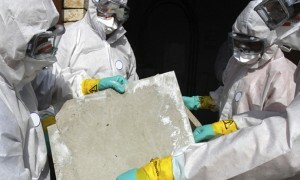 AQHI Inc. is your one-stop contractor for all kinds of asbestos removal in Palos Verdes CA. Asbestos was once valued for its ability to provide insulation without presenting a fire hazard, but today we know that these benefits came at a significant cost to human health. Asbestos removal in Palos Verdes CA is absolutely essential for safeguarding the health of individuals who live in older homes or frequent older business properties. Asbestos-containing materials are dangerous for their potential to release asbestos fibers into the air in the form of dust. Exposure to this dust can cause mesothelioma or even lung cancer. Why Can’t I Do My Own Asbestos Removal in Palos Verdes CA? First of all, professional training and experience are required to accurately judge whether or not a material is damaged enough to pose an active threat. Next, untrained individuals can actually leave a property in worse condition than they found it after attempting an asbestos removal in Palos Verdes CA. This may occur because you do not know the proper protocols for asbestos removal, containment, and cleanup, or because you do not have the skills or equipment required to implement these protocols. Lastly, it is difficult for the average person to dispose of asbestos waste safely. You can’t just leave it out for the garbage man and you can’t take it to a facility yourself either-you must have a hazmat transporter license for this activity. As you can see, there are simply too many complex variables involved with asbestos removal in Palos Verdes CA to justify attempting a DIY job. So don’t risk it! Instead, trust AQHI Inc. to provide safe and professional service every step of the way, from the first cut into the asbestos-containing material to the final cleanup and air purification. Acoustic Ceiling Removal: Whether you are talking about textured ceilings or ceiling panels, a removal job takes special skill because the material cannot be wetted down to minimize fiber release. Any asbestos fibers that are released will immediately become airborne and float down on workers’ heads. Fortunately, AQHI Inc. utilizes expert containment protocols to compensate for the extra challenges of asbestos ceiling removal. Do you think you may have asbestos-containing materials on your property? Call AQHI Inc. at 800-481-8080 for an honest assessment of your risk and a fair price on asbestos removal services. Our asbestos removal office for in Palos Verdes CA is open Monday through Friday between 8:00 AM and 5:00 PM and closed for lunch from noon to 1:00 PM. With advance notice, projects can be scheduled for weekends, early mornings and evenings.